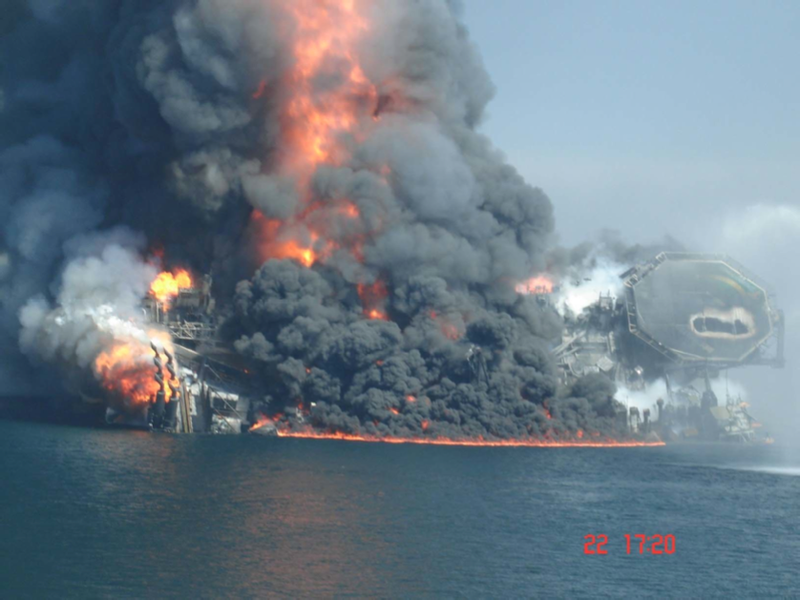 THE BP GULF OIL SPILL: A Matter Of National Security? Why does the US Federal Government continue to allow British Petroleum (BP), a serial criminal among oil companies, to control the biggest crime scene in American history?! Why hasn’t the Barack Obama Administration (BOA) simply taken complete control of the situation, moved BP out of the way and capped the well, permanently?! Instead, they allow BP to tell the US victims how and when to clean up BP’s very own crime scene (BP is part of the government-empowered unified command structure currently keeping scientists from doing their work in the Gulf and journalists from photographing oil slicks). Everyone agrees that a very serious crime against the People of the USA has been committed by this corporate behemoth. Many others firmly believe that it will soon become a crime against humanity, as the oil finds its way into the Seven Seas via the Loop Current, and then the Gulf Stream. And, of course, the many environmental groups from around the planet observe an unparalleled assault and eventual aquacide against a major water body and ecosystem, the Gulf of Mexico. How in the world did we get here? We have to step back in time to those unsavory GWB years to really understand some of the root causes. When George W. Bush and Tony Blair were negotiating their deal to commit an international war crime against Iraq, they had to come to terms, and quickly. The end result of their cattle-swapping was an extraordinary concession on the part of GWB in order to secure cover from the Brits to illegally invade a sovereign nation (for their oil), as though the Blair Administration could offer legitimacy for anything. The final deal gave BP an extremely generous and enormous stake in oil leases all over offshore America, especially in the Gulf of Mexico in those areas with the most proven oil reserves. BP also received extraordinary concessions to do drilling and exploration in high compression prospects, as well as the green light to drill at depths that the industry geologists knew were completely unsafe (i.e. the technology and equipment were simply insufficient to deal with the many likely contingencies). Herein lies the real megilla. You see, the Gulf produces upwards of 50% of the oil and gas necessary to fuel the US military. The wars in Iraq, Afghanistan, Pakistan, as well as those being waged by proxy by the Anglo-American juggernaut in many other regions around the globe, couldn’t be waged without this vital source of energy. End of story. Well, not quite. You see, BP, as a foreign multi-national corporation, can do things in the process of exploration, drilling and extraction of oil that US based companies can’t do. What and why, you may ask, would a foreign national corp (short for corpse) with a track record like BP’s be given so much latitude? How could they, of all oil giants, be the beneficiary of such permitting largesse, regulatory laxity and freedom of practice? Well, first of all, they were permitted to drill at depths to which no one else could drill – legally – because of the mother lodes waiting at the tip of their humongous drill bits. In the instant case we’re talking at the very least 50 to 100 million barrels of oil. Also, by their convenient foreign corporate distance from the US Government, they were practically immune to various oversight regimes that are normally imposed on their US counterparts. Wink, wink (|) (|). The insiders have all weighed in on the matter of what is really going on when you drill between 22,500 and 32,000 feet (they won’t tell us how deep) into the crust, and mantle, of the Earth. This is not only a HUGE undertaking technologically; the very mechanics and physics of the process occur with great untold risks. This is, in fact, well known by insiders to be an extremely speculative procedure, which is so experimental in nature that BP should never have proceeded, especially given the deficient state of the art (technology). Even with every single precautionary measure and failsafe mechanism firmly in place, this kind of a disaster was just waiting to happen. We now know that very few of these extraordinary measures were put into place. And that those that were, were not always properly executed. Nor were some critical SOP’s generally accepted by the oil and gas industry adhered to. Even when couched in the mildest euphemisms, this conduct by BP, its various contractors, as well as other commercial entities involved, was, is, and will continue to be shockingly cavalier and grossly irresponsible. Hence, we see a crime against a whole region of this nation … in living color. But why, pray tell, is the oil well still gushing, and the US Federal Government seems to take only casual notice (from their actions, not lip service) of the latest BP failed attempt to cap it?! Now were getting somewhere. And that is the sacrosanct matter of NATIONAL SECURITY. Given the political will to fight the aforementioned wars, as well as the desperate search to secure and produce massive amounts of crude oil to fuel those wars, the Obama Administration, as did its predecessor, has demonstrated a willingness to exploit reserves anywhere and everywhere they can be found. Witness the pronouncement BOA made on March 31 to end the ban on East Coast and North Alaskan shore drilling. But what does this have to do with national security? As far as a war-mongering Administration is concerned, everything. And although they will not tell us, their “out”, at the end of the day, will be national security. We are just too close to the crime scene in both time and space for them to hang their top hat on such an explosive disclosure. Perhaps the American population that domiciles throughout the entire SE quadrant of the US would take a little too much offense? When the Departments of Energy, Interior, Homeland Security and the EPA all completely fall down on the job, before and after the gusher blew, they obviously have a problem. Actually, it may very well become the biggest PR problem in US political history, as evidenced by the testy relationship brewing between Robert Gibbs and the Washington Press Corp. The press corps knows they’re being lied to. They just haven’t quite yet connected the dots. And since the Faustian bargain between Bush & Blair is supposed to be verboten for all time, especially within the MSM, what can really be said. Make no mistake, this whole saga does speak directly to the complicity between BP and BOA, and therefore both will be held accountable in the end. Truly, BP could not have gotten away with this crime, especially in broad daylight, were it not for the accomplice, BOA, setting up the crime scene in advance and giving cover during the cover-up. Environmental terrorism and ecological genocide, regional economic destruction and financial collapse, and the inevitable deterioration of the social fabric on this order and magnitude could only have taken place with the blessing of this Administration, as well as the full backing of the Military-Industrial Complex. The US military and Big OIL do, after all, just about own the Gulf Coast, as well as many of the economies of those same bordering states. But, really, did the US Federal Government sacrifice an entire regional economy, environment and way of life for a single oil well? As the Enabler-in-Chief, this president has most unfortunately shown a readiness to advance an agenda that is perfectly consistent with that of his predecessor. Remember, a quite nefarious back room deal was made (not on his watch), but he appears to be sticking to it come hell or oily water. The BOA apparently does not realize that too big to fail now translates to too big not to fail, particularly in light of the looming and awesome consequences to this nation, as well as to the world at large. Given the enormity and gravity of this catastrophe, it will eventually come down to the same timeworn and patent excuse from the politico-speak crowd, as well as “corroborating” and limp explanations from the military-industrial complex word merchants, known as national security. And then the American people will be forced to contemplate: At what price?